On the second day of Investments in Water Innovation Week, The Water Council attended the Wisconsin Innovation Awards (WIA) in Madison, WI as part of the Forward Technology Festival. The Water Council’s BREW accelerator program was nominated for its innovative approach to cluster development by incorporating the country’s only vertical accelerator solely dedicated to addressing global freshwater challenges. The Wisconsin Innovation Awards, the first year presented, seek to celebrate and inspire innovation. The WIA highlights and honors the development of groundbreaking and innovative ideas. The awards hope to encourage an even greater environment of innovation by bringing innovators together from various business sectors throughout the State. The Water Council is pleased to announce that The BREW accelerator was honored to take home one of 10 Wisconsin Innovation Awards at the ceremony. We are even more pleased that several of our Members took home awards as well! 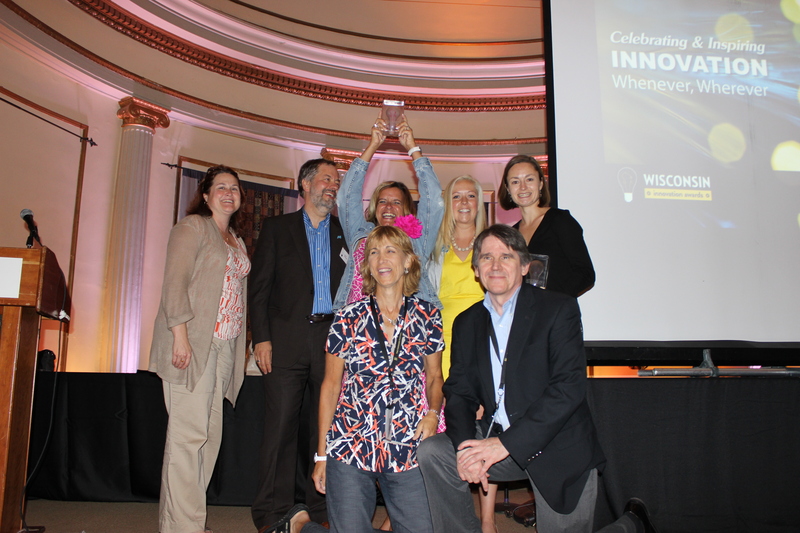 Congratulations to Microbe Detectives, Marquette University, and Discovery World for all being recognized with an inaugural Wisconsin Innovation Award! The BREW, which stands for Business. Research. Entrepreneurship. In Wisconsin., will launch Batch II of the freshwater accelerator winners this week during the Batch II Welcome Reception, where the new class of winners will officially be welcomed to Milwaukee’s Global Water Center. The Global Water Center is located in Milwaukee’s Historic Walker’s Point neighborhood, and is directly adjacent to Reed Street Yards, a future water technology business park currently under development. The evening will include brief remarks, and a check presentation to the six Winners of Batch II. The Water Council and JPMorgan Chase and Co. announced Monday a partnership through Chase’s just launched Small Business Forward program, which is a five-year, $30 million grant program meant to boost small business support networks that help growing enterprises in specific industries. Immediately following the press conference, attended by Wisconsin Governor Scott Walker and Milwaukee Mayor Tom Barrett, The Water Council and JPMorgan Chase and Co. hosted a brief panel discussion focused on the importance of investing in the emerging growth sector. Coverage can be found HERE. Watch the full JPMorgan Chase and Co. Press Conference video coverage by WisconsinEYE, HERE. Watch the full Advantages of Investing in Water Innovation Panel Discussion video coverage by WisconsinEYE, HERE. Next up for Investments in Water Innovation Week is the The BREW Batch II Welcome Reception, Wednesday evening, followed Thursday afternoon by an Informational Meeting hosted by WEDC to discuss opportunities for how Wisconsin water technology companies can engage with The Water Council and the Wisconsin Economic Development Corporation during the Water Environment Federation’s Technical Exhibition and Conference (WEFTEC) in New Orleans. The Wisconsin Innovation Pavilion (Booth 4045) will be located just outside of the official WEFTEC Innovation Pavilion. More information can be found HERE. Watch for additional coverage later this week, including photos and event recap of Investments of Water Innovation Week. This entry was posted in Events, In the News, Tenant News, The BREW and tagged Discovery World, Investments in Water Innovation Week, Marquette University, Microbe Detectives, The BREW, The Water council, Water Innovation, Wisconsin Innovation Awards. Bookmark the permalink.